Walking through the woods on July day recently sparked a reminder of Marietta’s earliest days as a new settlement in 1788. Our two English Sheepdogs Sophie, Tess, and I ambled down a trail near our home. It was a sunny and mild Sunday in July - a welcome break from the typical heat and humidity. Sunlight filtered through the trees. We stepped into a cathedral of total shade at the waterfall under a canopy of towering maple, oak, and sycamore trees. It was quiet. Only the gentle patter of the waterfall and the wheezy buzz of a seasonal cicada were audible. Later that same day, the dogs explored the edge of a bluff above the creek. Suddenly there was an explosion of flapping wings and squawking as a flock of turkeys launched themselves down the valley. The towering trees, turkeys, and the quiet reminded me of Marietta’s earliest period 230 years ago in July of 1788. The tall trees hid the sun needed to grow crops needed for food. Turkeys were a welcome source of food, but large flocks also damaged crops. It was quiet then: there were just a few dozen people around. Only sounds of nature, people talking, and hand tools would have been heard. Yet it was a busy July of 1788 in the new settlement at Marietta. A year had passed since the passage of the landmark Ordinance of 1787 which created the first United States territory beyond the original thirteen states. Now it was time to bring that new territory to life. 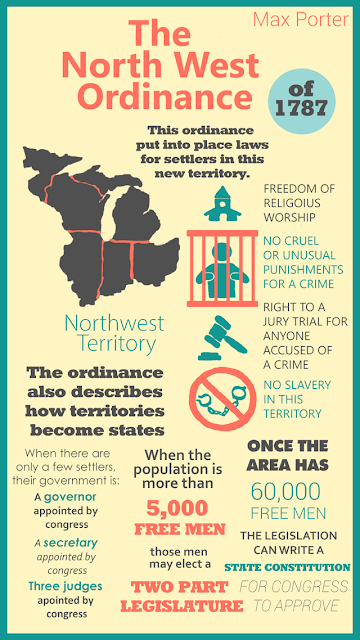 The government of the new territory was officially installed on July 15. Governor St. Clair was conveyed from Fort Harmar to the “Bowery” (a long covered area erected near the Muskingum River) on the east side on a barge with “Congress” written on one of the oars. He was greeted by General Rufus Putnam and two of the three territorial judges, Samuel H. Parsons and James Mitchell Varnum. Putnam gave brief welcoming remarks. Secretary Winthrop Sargent read the commissions of the governor, judges, and secretary. St. Clair gave an address. Major General Arthur St. Clair, first Governor of "The Territory North and West of the Ohio River"
He praised the character of territorial leaders, mentioning their concern for religion, morality, love of liberty, willingness to sacrifice, respect for the rights of mankind. This went beyond mere rhetoric; it truly reflected the attitudes of the leaders. He observed that the legislative function of the new territorial government was only a temporary one: There was no elected legislature at this early stage. The Governor and Judges formed a legislative council to enact laws and could only enact laws adopted by other states. He gave assurance that acting in the best interests of the residents under this technically undemocratic system was "...a very important part of our duty, and will be attended to with the greatest care." He further pointed out that Congress could annul territorial laws which it believed were not lawful or suitable. Despite hardships in the new settlements, he encouraged patience and perseverance, along with a keeping a vision of a successful future. He devoted a significant part of his comments to the relationship with Indians: "Cultivate a good understanding with the natives...., treat them on all occasions with kindness, and the strictest regard for justice, run not into their customs and habits, prevent....reproach." Such conduct, he argued, would make them less hostile and more open to a peaceful existence. General Putnam gave a brief response and "three cheers closed the ceremonies of the day." The citizens of Marietta issued a written response to St. Clair's speech. A committee including Ebenezer Sproat, John May, and Paul Fearing delivered that response to Governor St. Clair on July 17. Governor St. Clair had been engaged in governing since his appointment in late 1787. His primary focus was arranging for a treaty negotiation with Indian tribes in the Ohio country. Congress had tasked him with this daunting assignment shortly after his appointment. 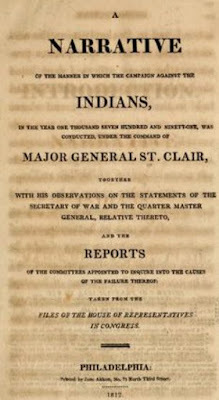 On the very same day of his inauguration, he had corresponded with Secretary of War Henry Knox, regarding an Indian skirmish at the Falls of the Muskingum River where treaty negotiations were to be held. Click on link to learn more about the Treaty of Fort Harmar. The Governor and Judges issued their first Territorial law on July 25, 1788, "A Law for regulating and establishing a militia of the United States northwest of the river Ohio.... " A few weeks later, Washington County, Ohio was created. In September, the “Court of Quarter Sessions” - what we refer to as common pleas court today - was convened with much fanfare. There was a procession from the Point to a room in the northwest blockhouse at the Campus Martius fortified enclosure led by Sheriff Colonel Ebenezer Sproat riding on horseback with saber drawn. Appointed judges Rufus Putnam and Benjamin Tupper were seated on the bench. Reverend Manasseh Cutler, visiting the settlement, offered a prayer. Colonel Sproat intoned these words: "Oh yes! A court is open for the administration of evenhanded justice , to the poor and the rich, to the guilty and innocent, without respect of persons; none to be punished without trial by their peers, and then in pursuance of the laws and evidence in the case." The bold experiment in territorial government that would be the base for state formation and nation building in the United States was well underway in late 1788 - in Marietta, Ohio. 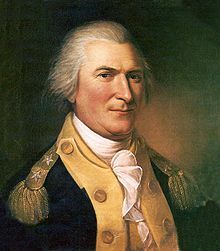 He served in the French and Indian War, Revolutionary War, and U. S. Army after the war, eventually achieving the rank of Major General. But he experienced two setbacks. One was a controversial retreat from Fort Ticonderoga which led to his court martial; he was exonerated. 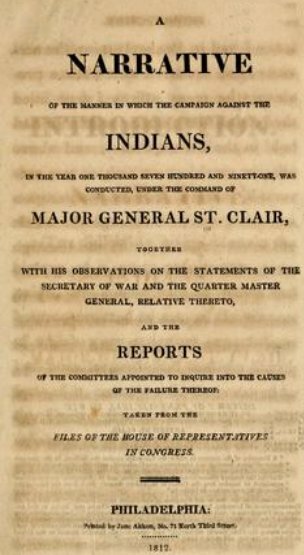 The other was a humiliating defeat by Indians in western Ohio in November, 1791. His oldest daughter Louisa drew superlatives from locals when he and the children lived in Marietta. She was described in The St. Clair Papers as full of life, expert equestrian - dashing around Campus Martius in full gallop, rapid skater, elegant in appearance, capable hunter, skilled with a rifle which she could load and fire as well as any backwoodsman, yet refined in manners and well educated. St. Clair acquired wealth but lost much of it as a result of military service in the Revolutionary War. He regained wealth later in life but suffered financial loss when a loan he co-signed defaulted. He died in poverty in 1818 at his home near Greensburg, PA. He was a Federalist whose preference for a strong national government and elitist leadership left him at odds with the grassroots conservatism prevalent in the new territory. He opposed Ohio statehood. Instead he espoused dividing the Ohio land into two sections with the Scioto River as a north-south dividing line - regions that he thought could generate a Federalist majority. Sources: All of these were viewed on line unless noted. Timely article and most informative.